Hi, my name is Olaf. Fasting is defined as an act of willing abstinence from food for a prolonged period. The objective of a fast is to give the body a break from digesting food, though allowing the natural repair processes within the body, to take place. When food intake stops, the body is compelled to live of the energy it has stored, primarily body fat. The main purpose of having body fat is to temporarily store it as an energy source. If we did not have this storage capability, we could not sleep through the night between dinner and breakfast, without having to wake up and snack every few hours. Because body fat is the main energy source during a fast, this time period can be very effective in reducing body weight that is carried in the form of excess fat tissue. Within the first twenty four to forty eight hours of fasting, the body enters into a state known as ketosis. This is a natural condition where compounds called ketones start to be produced in the liver, from body fat being mobilized for energy. The only way fat can fuel the brain is when it gets converted into Ketones. Once blood sugar starts to drop, as it inevitably does during a fast as the glycogen (sugar) stores gradually become depleted, then Ketones become the only other alternate source of fuel for the brain. Ketosis is a completely natural state and an essential bodily function, especially during a fast. On the 12th of January 2015, I embarked on an extended fast. The main purpose of this test was to lose some body fat and experiment with being in high-level Ketosis for a prolonged period of time. Within forty eight hours of commencing my fast, I became very mentally alert and sleeping beyond four to five hours per night was impossible. I later concluded this was due to Ketones being an extremely effective brain fuel. At the time I did not have access to Ketone testing, so instead I tracked my blood sugar level up to ten times per day. Knowing that Ketones must go up whenever blood sugar goes down, made this an indirect way of measuring my state of Ketosis. Late evening on day four I was so wide awake, which worried me a bit, even though I was feeling fine. As a precaution, I decided to break my fast and resume eating at this time. 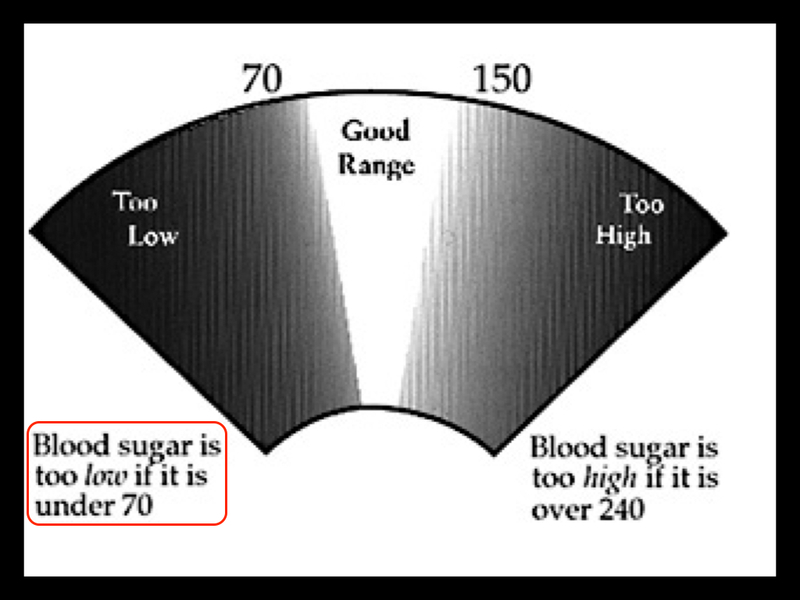 In most medical literature, normal blood sugar is defined as being 70 mg/dl or above, anything below is considered to be on the verge of hypoglycemia (low blood sugar). Below is how my blood sugar level fared over this period, it dropped down to a low of 58 mg/dl by mid afternoon on day four. The transformation in my physique was not extraordinary, but quite impressive after only four days. A great deal of the weight lost seemed to be water and my appearance was now less bloated. My photos and weight measurements are all taken late morning in a fully hydrated state versus first thing in the morning where the body can be somewhat dehydrated. The photo on the 16th of January 2015 was taken approximately twelve hours after I decided to end my initial four day fast. My total weight loss at this point was 3.6 kilos / 8 pounds. I ate food normally for three days and resumed fasting on the 19th of January 2015 while continuing to monitor my blood sugar several times a day. In an attempt to deplete my glycogen (sugar) stores quickly and thereby enter into a state of higher fat burning faster, I performed a brief hill sprint workout for the first five days during my second round of fasting. The workout consisted of three intervals, approximately one minute each, sprinting up a 200 meter/ 220 yard hill at close to maximum effort. Having done extensive testing (since my fasting experiment) on my blood sugar and ketone levels immediately before and after exercise, I now have some doubts whether this attempt was successful in speeding up my body’s fat burning, it may even have been a hindrance. The immediate effect of intense exercise (at least on my body), is an elevation of blood sugar which is the opposite of what is needed when trying to burn body fat for fuel. I also found, that my blood sugar level would stay elevated for several hours after my workout. Seen here is my blood sugar range throughout the ten day fast. The high recordings on days 1 to 5 ended up being the ones immediately after my sprint workout. An interesting observation, was that I ran faster times for each sprint on day 5 compared to day 1. To me, this demonstrated how the body always preserves and maintains enough glycogen stores in order to physically perform at a high level when needed – despite being deprived of food intake for several days. On the morning of day 7, my blood sugar was down to 49 mg/dl, a dangerously low level, according to most medical standards. However, as mentioned earlier, the danger was only relative if my liver had not produced ketones from body fat stores to replace blood sugar as my major energy source. I also maintained a light exercise regime throughout the entire fasting period, consisting of a 40 minute mountain hike twice a day, as well as my 15 minute daily handstand routine. On the morning of day 10, I ascended the mountain hike in my fastest time ever and proceeded to make a personal best, for the amount of time I could hold a hand stand. I have been asked on several occasions, whether I lost muscle mass during my fast. Without doing a proper before and after body composition test, there is really no way to know for certain, but judging from my photos and how I felt throughout, I don’t believe this was the case. 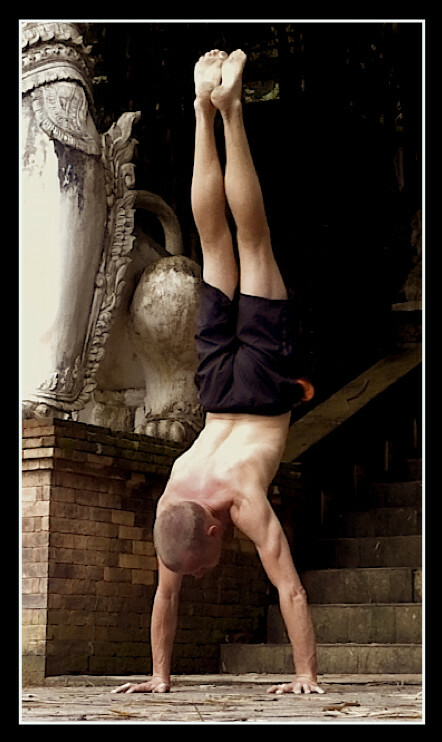 Had I been breaking down muscle tissue, it would have been almost impossible to perform physically on day 5 (faster sprint times) and day 10 (PB hand stand and hike time) as I did. Below are the final before and after comparison photos of my entire fasting period spanning a total of sixteen days, including three days of non fasting. 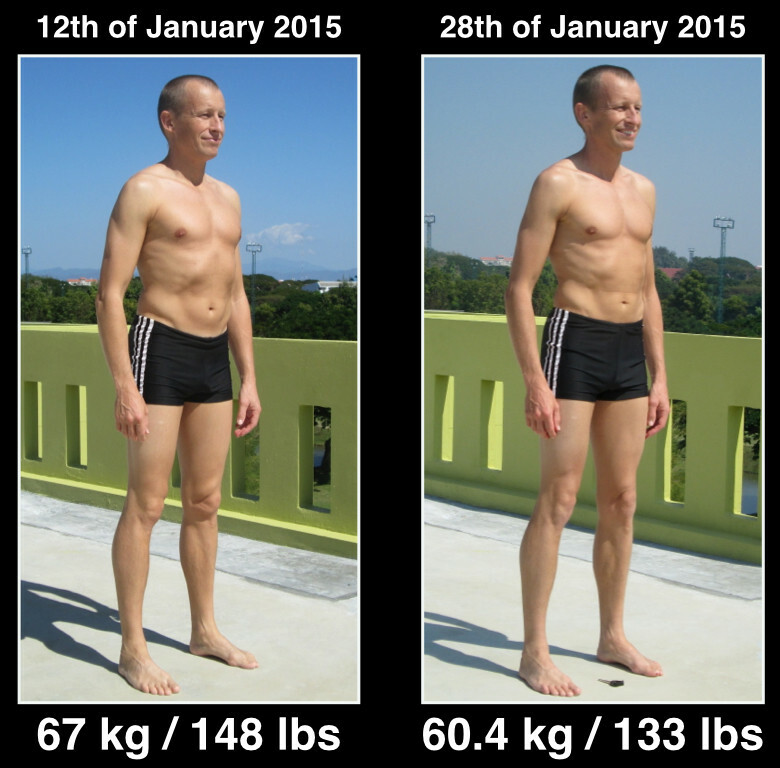 In sixteen days, I lost 6.6 kilograms / 15 pounds, this was close to ten percent of my starting body weight. The telling tale with any rapid weight loss is of course, how much is permanent? Within the first two weeks of resuming a regular eating schedule again, my weight slowly increased about 2-3 kg / 4-6 pounds. For the past 3 months, while consuming my regular ketogenic diet of low carbohydrate high fat and not restricting calories in any way, my weight has remained stable around 63 kg / 139 pounds. I view fasting, when done properly, as a way of re-compositioning the body and achieving one’s ideal body fat percentage without losing lean muscle, in the process. Fasting may even be the quickest, safest and most efficient way to shed body fat – because of the natural high fat burning rate, while the body is in a state of ketosis. 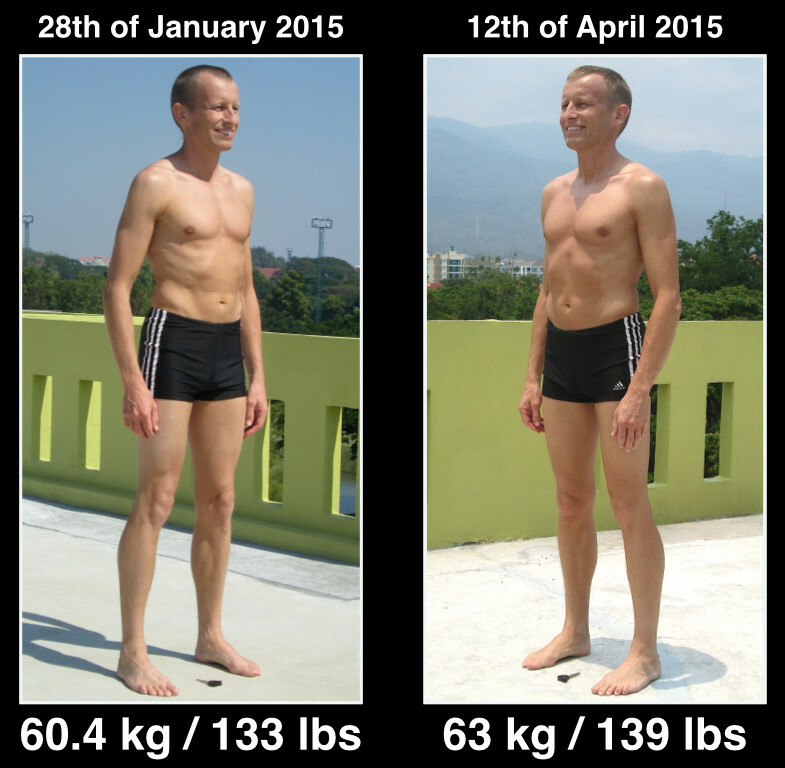 Here you see my latest weigh in and photo session on the 12th of April 2015, compared to the 28th of January – the last day of fasting. It is very easy to measure your own ketone level. A monitoring meter like the Precision Xtra will tell you instantly what your blood ketone level is. This meter is developed for diabetics and can measure both ketones and blood sugar. 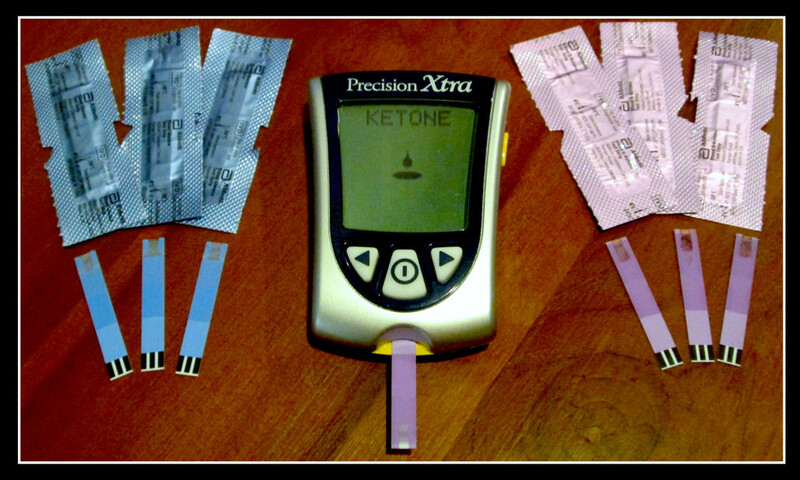 The blue strips shown here are used to test your blood sugar, while the purple are for ketone testing. These are the terms which Dr Jeff Volek and Dr Stephen Phinney, in their book The Art and Science of Low Carbohydrate Performance attribute to the ascending ketone blood level. In the Optimal Ketone Zone, Dr Volek and Dr Phinney estimate that Ketones are being utilized most effectively as energy by the brain, but also to fuel muscles and other organs. 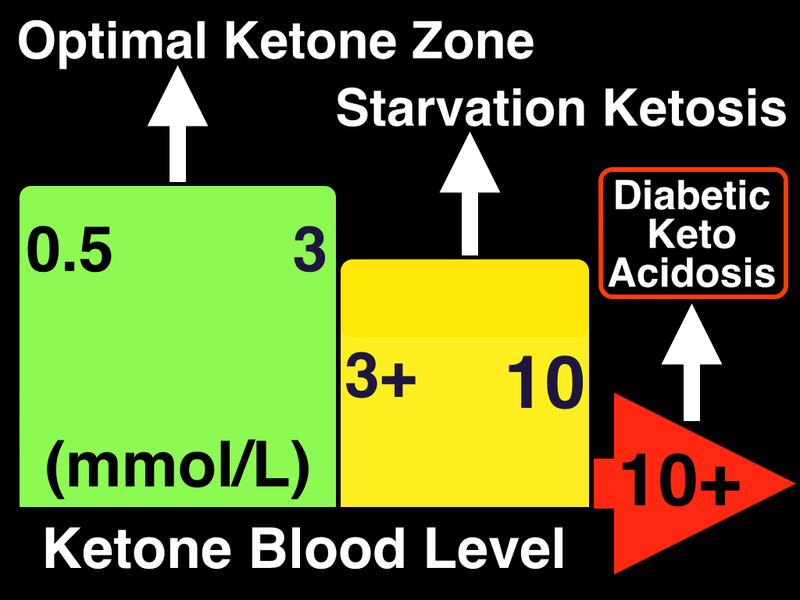 During Starvation Ketosis, fat is being metabolized and converted into Ketones at a higher rate. This happens in a scenario like fasting or if eating a high fat and very low carbohydrate diet on a consistent basis. 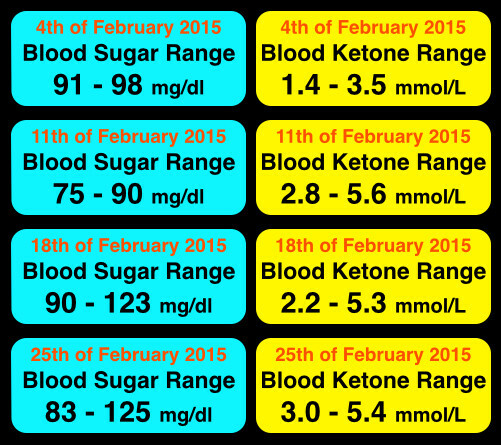 At 4.37pm on the 28th of January, the last day of fasting, I finally got access to Ketone testing. My very first test, the meter showed HI, this happens when the ketone level is above 8 mmol/L, needless to say, I was in a high state of Ketosis. At exactly the same time, my blood sugar was low (68 mg/dl), which meant I was in a healthy state of ketosis and nowhere near Diabetic Keto Acidosis, as described above. I probably entered into an elevated state of ketosis, soon after starting to fast. This would explain my high level of mental alertness and less need for sleep throughout the sixteen days, due to ketones being a “super fuel” for the brain. In The Daily Ketone Advantage, I have written about the benefits of being in ketosis on a daily basis. According to the results from my self testing, drinking coffee seems to very consistently, correlate with a rise in ketone level. While fasting, I only drank water plus two to three cups of coffee with heavy cream a day, so in a sense I was getting a very small amount of calories daily. Every time I tested the effects of coffee, it seemed to stimulate ketone production – or at the very least, I can say, it never seemed to inhibit my ketones from rising. Here are a few snap shots of my daily blood sugar and blood ketone range at 7, 14, 21 and 28 days after completing my fasting experiment. I have settled into a quite a high level of ketosis and rarely does my ketones drop below 2 mmol/L, even on days where my blood sugar remains in the 90 – 100 mg/dl range. On the 18th and 25th of february, the rise in blood sugar to 123 and 125 mg/dl, were tests taken immediately after a sprint workout. 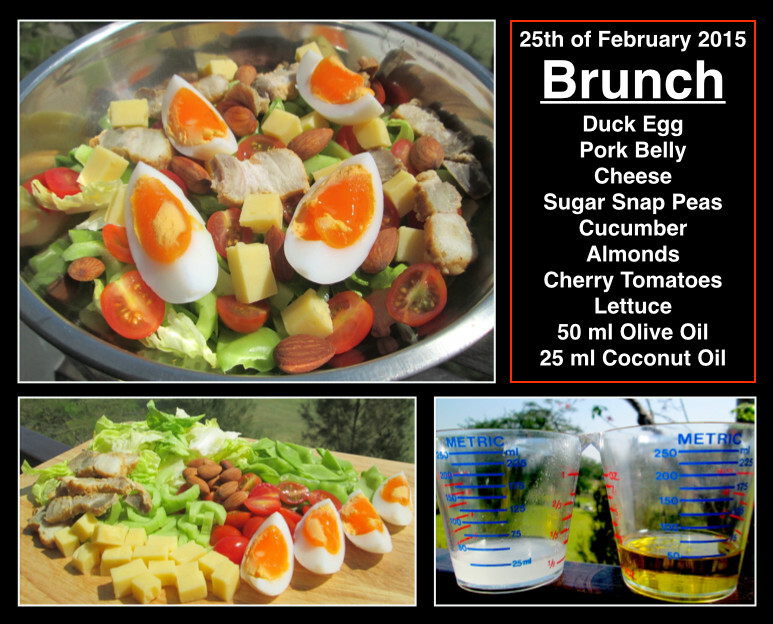 Seen here is a detailed description of my testing on the 25th of February – 4 weeks after ending my fast. 6.35am – my first test, immediately upon rising and not having consumed anything since the previous night. I then went for an easy 30 min walk followed by a cup of coffee with heavy cream and remained quite sedentary for the next few hours, sitting in front of my computer. At 11am, I had what has become a very typical brunch for me now a days and proceeded to do a second blood test at 12.03pm – approximately 30 to 40 minutes after finishing my meal. 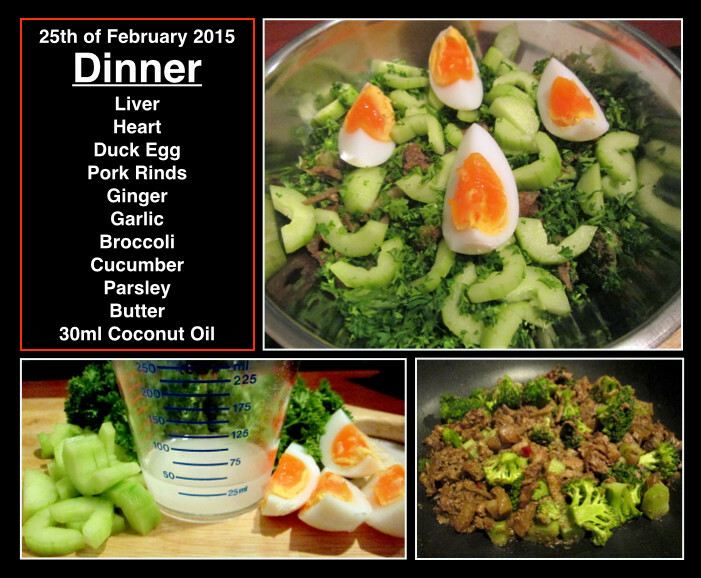 As you can see, this meal did not affect blood sugar and only helped to increase my ketone level. By 4.34pm I took my third test for the day, after having had a second cup of coffee with heavy cream and otherwise remaining sedentary by sitting down most of the afternoon doing computer work. I find, without a doubt, that remaining sedentary in combination with having coffee will give me the lowest blood sugar level and highest measure of ketones. 6.22pm was approximately 20 minutes after completing my regular 40 minute mountain hike followed by a brief hill sprint session. ha As always, the intensity of hill sprinting – increased my blood sugar and dropped my ketones. 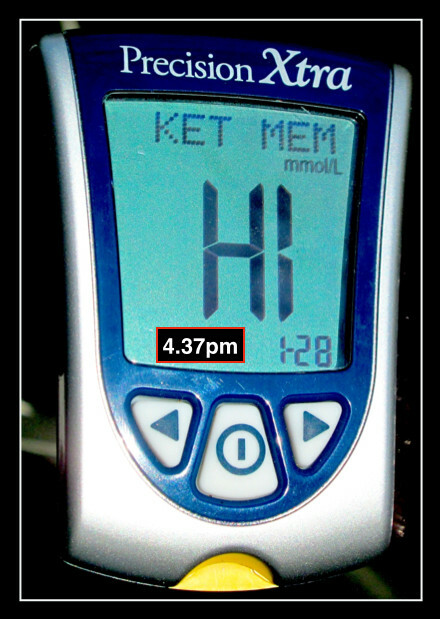 11.03pm, just before going to bed and about 2 hours after having eaten dinner, my blood sugar had returned to normal and ketones were once again rising. At the time of writing this post, my daily low level of ketones, seems to be on the rise once again. As mentioned previously, rarely will I drop below 2 mmol/L at any given time. However, according to my ongoing and most recent testing, this number is now starting to stay above 3 mmol/L most of the time. This essentially means, that I am maintaining Starvation Ketosis in a fully fed state and therefore very effectively metabolizing the high amount of fat I consume on a daily basis into energy. Exercise, maybe not so good for weight loss? 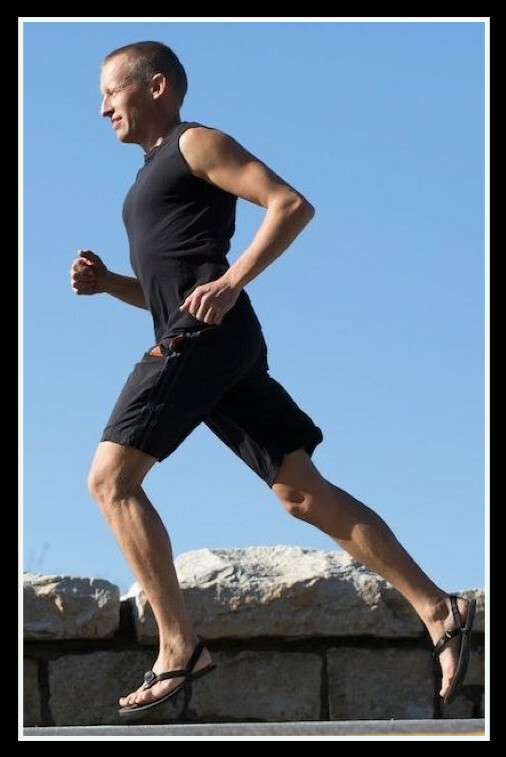 I have found exercise and more so intense physical activity, to be a major factor which lowers ketones and raises blood sugar. Currently, I am experimenting with how to maintain a high state of ketosis while simultaneously increasing my exercise volume and intensity. Exercise in relation to ketosis and weight loss, will be the subject of my next post. I hope you have found this post informative, interesting and maybe helpful if you have ever been curious about or experimented with ketosis, fasting and a high fat low carbohydrate diet yourself. Feel free to leave a comment below or ask me any question regarding my experiment and I will do my best to answer it for you.